These numbers reflect estimated student expenses for the 2018-2019 school year. Amounts will change slightly from year to year, but as the cost of college increases, the scholarship packages will correspondingly increase. Your official financial aid award will be included in a letter directly from Macalester. The first $500 of outside funding will not affect grants from Macalester. Macalester grants will be reduced by fifty percent of the amount of outside funding exceeding $500. Federal Work-Study may be reduced to comply with Federal Student Aid rules requirements. Total grants and outside funding may not exceed the cost of attendance. Macalester requires all students to have health insurance. If the student is not covered by his or her own health insurance plan, Macalester will provide a grant to pay for the Macalester College health insurance plan. Students are expected to pay for travel to and from campus as part of their contribution from summer work and/or academic year earnings. 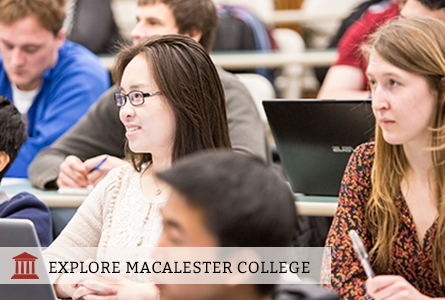 The grant from Macalester will be increased based on the estimated cost of travel. Students must reapply each year for financial aid in order to maintain the match scholarship award. The grants provided will include a Campus Residence Grant which cannot be used when a student resides off campus (typically during junior and/or senior year). The 2018-2019 Campus Residence Grant is $1,112. Macalester is committed to meeting 100% of demonstrated financial need for all admitted students. 70% of U.S. first-year students receive need-based financial aid in fall of 2017. Learn more about your eligibility for financial aid by using Macalester's Net Price Calculator.